Pretty much everyone knows how to put fuel into a conventional car. Electric-car charging isn't quite that simple. 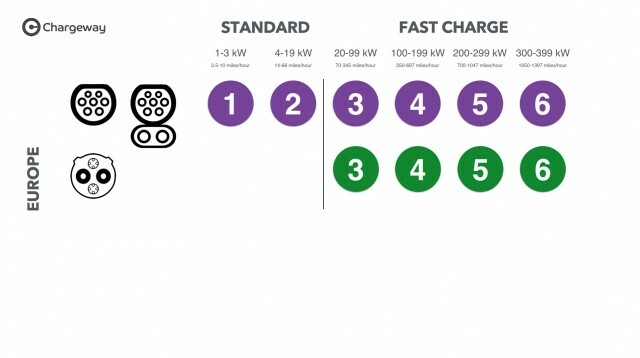 There are three types of charging, for starters: 120-volt Level 1, 240-Volt Level 2, and no fewer than three separate DC fast-charging standards. There are several different plugs, and the same car can charge at different rates depending on the charging station and the network operator—except those rates aren't visible. And versus the usual array of 87, 89, and 93 octane, consider the names: J-1772, CHAdeMO, Combined Charging Standard (CCS) or "SAE Combo," and Supercharger. As Matt Teske's wife pointed out, "The plugs look like like Star Wars characters, and the names do too." Teske is a marketer in the Portland area who's worked on various automotive projects for more than a decade and bought his first electric car a few years ago. The challenge of explaining electric-car charging to novices has nagged at him ever since. Earlier this year, in true activist fashion, he sat down and started sketching. What was needed, he thought, was a simple, uniform graphic way to explain which plug-in electric vehicles could use what kinds of charging—and the speed of that charging. 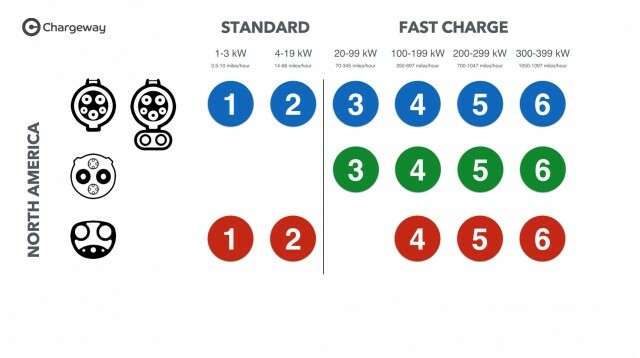 The result is a simple system of color-coded circles for charging standards, with a single number inside to indicate how fast the charging is. The higher the number, the faster the charge. The system is future-proofed and global: new charging methods like wireless can be added with a new color, and China and Europe get a mix of the same colors and numbers with some new, locally appropriate ones added. Teske calls the system Chargeway, the simplest name he could come up with that hadn't already been registered. The Chargeway symbols are graphically simple, instantly identifiable, and usable in a huge variety of locations. 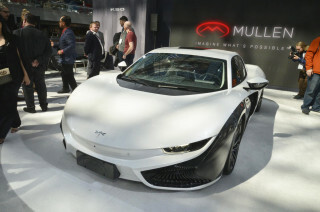 He envisions each plug-in car having the symbols appropriate to its charging capabilities on a hangtag on the mirror when the car is delivered. All the new owner needs to know is that he or she can charge a Leaf at stations that show a blue 1, a blue 2, or a green 3 symbol—rather than "J-1772 Level 1," "J-1772 Level 2," and "CHAdeMO DC fast-charging at 50 kilowatts." 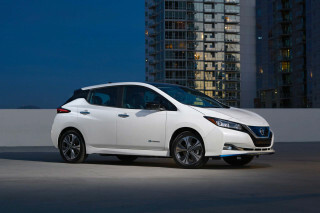 CHECK OUT: DC fast charging for electric cars: what's here, what's coming, what's hype? Those numbers could be repeated inside the charge-port door, and they would appear on the corresponding charging stations. Teske envisioned them as an addition to the standardized highway signs now rolling out that indicate available charging stations ahead: drivers would know at a glance whether the rest stop 2 miles ahead could charge their car. 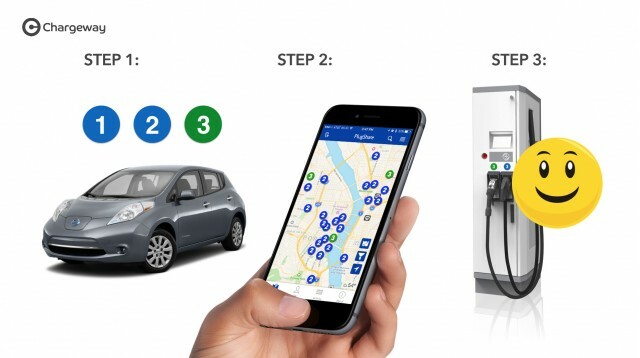 And the system could easily be layered into existing smartphone apps like Plugshare that locate nearby charging stations, the apps for charging networks like ChargePoint, EVgo, and GreenLots, and the "Find Nearest Charging Station" functions of in-car navigation systems. 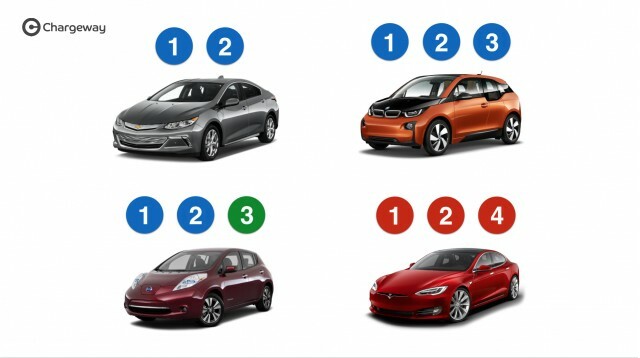 What's easier, asking your better half to open an app and then to "find me the nearest blue 3" ... or to "sort for 'DC fast-charging,' then for 'CCS'—or maybe that app calls it 'SAE Combo'—then find me the nearest station"? Chargeway made a quiet, semi-public debut at the EV Roadmap 10 conference in Portland that just ended, organized by Forth (nee Drive Oregon). This year's EV Roadmap drew a sellout crowd of 600 novices and electric-car experts from car companies, charging networks, electric utilities, advocacy groups, government entities including cities, state, and federal level, and more. And Teske's Chargeway concept received rave reviews from virtually everyone he showed it to, including Green Car Reports. 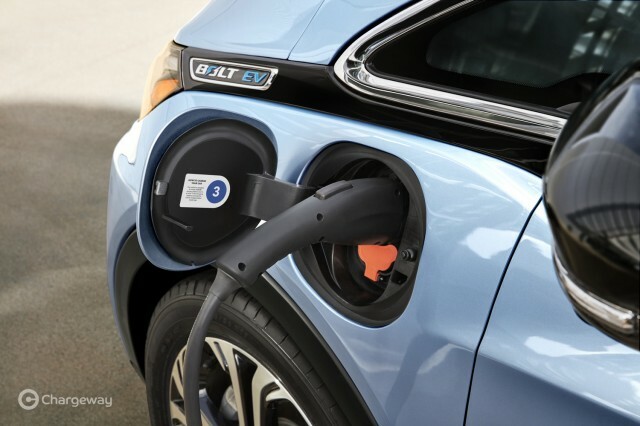 "We need this concept to be seen and [backed] as soon as possible by all industry stakeholders: car and charging manufacturers, regulators and environmental organizations," said Shad Balch from Chevrolet. The language barrier in discussing electric cars and how they're charged, "has become a roadblock to selling more vehicles," Balch told us. To increase sales, every party has to speak "the same consumer-friendly language." "A common standard of words, symbols, and meanings is desperately needed," Balch said. "The Chargeway concept translates complex EV terminology into a simple and easy-to-understand language that can be used on vehicles, in dealerships, at charging stations, even on highway signs." "Government, automakers, electric utilities, and charging-station providers should all get on board as soon as possible,” he concluded. 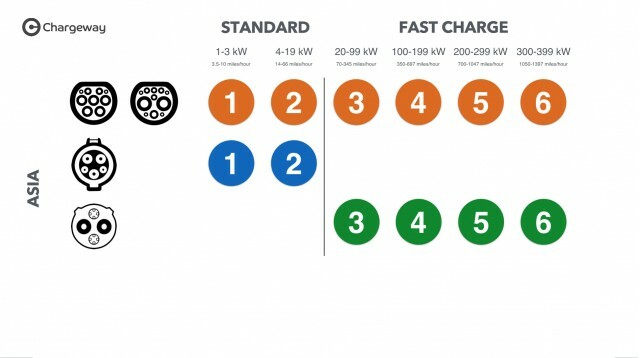 "The Chargeway description of the various types and speeds of EV charging makes it super easy and simple for consumers to understand," added Katherine Stainken, policy director for advocacy group Plug In America. "The system adapts the way drivers of a gas car think about filling up to how electric-car charging works," she continued, which can definitely help us achieve mass adoption of EVs more quickly, and make the charging experience for new drivers seamless." Teske is continuing to talk to a variety of parties about Chargeway, with hopes of getting a pilot project underway—perhaps in the Portland area—to test the concept within several weeks. For those seeking more information, Teske activated the Chargeway website just before he walked into the first day of the EV Roadmap conference. EDITOR'S NOTE: In the spirit of full disclosure, Green Car Reports editor John Voelcker is one of several members of the council of advisers for Forth, the former Drive Oregon.